GIFT100 Defender $100.00 Gift Certificate Defender Don't let Defender's selection of over 30,000 items overwhelm you. GIFT150 Defender $150.00 Gift Certificate Defender Don't let Defender's selection of over 30,000 items overwhelm you. GIFT200 Defender $200.00 Gift Certificate Defender Don't let Defender's selection of over 30,000 items overwhelm you. GIFT25 Defender $25.00 Gift Certificate Defender Don't let Defender's selection of over 30,000 items overwhelm you. GIFT300 Defender $300.00 Gift Certificate Defender Don't let Defender's selection of over 30,000 items overwhelm you. GIFT400 Defender $400.00 Gift Certificate Defender Don't let Defender's selection of over 30,000 items overwhelm you. GIFT50 Defender $50.00 Gift Certificate Defender Don't let Defender's selection of over 30,000 items overwhelm you. GIFT500 Defender $500.00 Gift Certificate Defender Don't let Defender's selection of over 30,000 items overwhelm you. 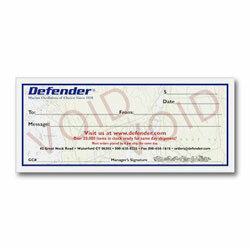 GIFT75 Defender $75.00 Gift Certificate Defender Don't let Defender's selection of over 30,000 items overwhelm you. GIFT1000 Defender $1000.00 Gift Certificate Defender Don't let Defender's selection of over 30,000 items overwhelm you.